Shopping for Marvel vs. Capcom Statues? Stand clear! Emma Frost is here! Limited edition SDCC 2011 Exclusive statue of the X-men mutant. 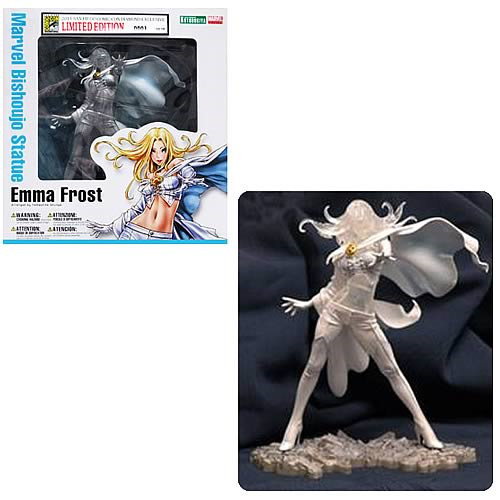 Features a bishoujo-styled face, along with Frost's flowing hair and cape. Add The White Queen to your Marvel collection! San Diego Comic-Con 2011 Exclusive! Grab this Kotobukiya clear-form statue of Emma Frost as The White Queen! Standing about 8-inches tall including the environmental display base, the X-men mutant features a bishoujo-styled face, along with Frost's flowing hair and cape. Add The White Queen to your Marvel X Bishoujo Collection of iconic super heroines and villains! Limited edition of only 1,500 pieces. Ages 14 and up.